For a recent video-game costume party, I made a Tron Jacket! I've always wanted to make one, and things finally came together for it. I got an awesome (fake) leather jacket at a RoboCop remake props sale, and then this party popped up on my radar, and I knew I had to do it! There are lots of interesting examples of Tron Jackets on google image search. I tried the reflective tape idea, but I didn't like how it looks close up, and it's also highly dependent on the illumination in the room (works best in black light!). I also played with EL-strip, which is awesome because it's wider than than the EL-wire, but I found that the lamination was so inflexible that actually working with it on clothing was basically impossible. Despite hints here, I couldn't figure out how to cut and resolder it (basically the interior is made of paste, so soldering to it directly certainly doesn't work), and it doesn't bend, so I think it's basically only suitable for long linear strips, like on a car or bike or something like that. Anyway, with those two options out of the way, I settled on EL-wire for sure. So I bought 2x 10 foot lengths of white EL wire at Creatron, and associated inverters/battery holders. At the insistance of a friend, I decided to do it non-destructively, meaning: I can't sew the EL-wire into place using clear thread, which is the best way to hold it in place. I walked in a local sew shop and asked the owner there about how to attach things to leather, and he sold me what he called "leather double sided tape". I tested it on the fake-leather and it does indeed stick things good, but comes off without leaving a mark (or even sticky patch, it kinds of rolls up under heavy friction). Then I traced some patterns on the jacket with reference to some of the images online, and started putting the EL-wire unto the jacket. I put the inverters in the front pockets and had to make six holes in the end: out of battery pocket, then up and around to back of jacket, then into the interior, and back out for the circle on the back, that's half, double it for the other side. Over-all the effect is great, I got a lot of compliments at the party, in the dark it's super convincing. In better light, you can totally see the glue, and the black tape I used in places to make the circles stand alone (with no connecting light). And the glue proved to be more temporary than would be really desirable - the EL-wire starts to lift off in places after a couple of hours, and by the end of the night it was getting impossible to have it not lifted somewhere. Still, I'm happy to have my jacket mostly non-damaged, so it was the right choice. 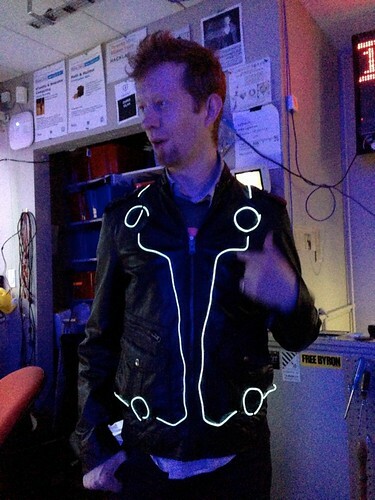 If I ever get a second leather jacket though I totally want a full-time Tron Jacket!